3herosoft DVD to iPod Converter is the best DVD to iPod Converter tool which can rip and convert any movie DVD to iPod video MP4, H.264, MOV and iPod audio MP3, M4A with superb sound and picture quality. The converted video and audio files can be played well on iPod classic, iPod touch, iPod touch 4, iPod nano, iPod nano 5G, iPhone 3, iPhone 4, iPhone 5, iPhone 5S/5C, iPhone 6/6 Plus, iPad, iPad 2, the new iPad, iPad 4, iPad mini, even the latest iOS 8 and iTunes 12. 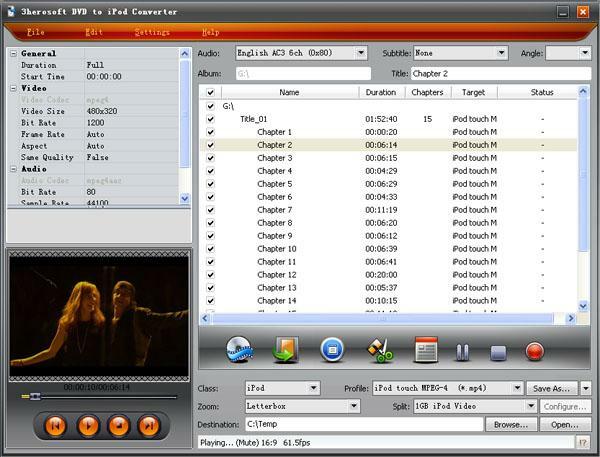 This DVD to iPod converter helps you rip any selected DVD chapters or titles to iPad video and audio files, select target subtitle and audio track, adjust Sample Rate, Duration and Start Time, Bit Rate, customize file size, and split large file with various modes. Compared with other same DVD to iPod converter, 3herosoft DVD to iPod Converter mostly provides lots of significant features for you to operate comprehensively. Whether you are an experienced user or a beginner, 3herosoft DVD to iPod Converter is always your priority selection! Download DVD to iPod Converter for free and enjoy your favorite DVD movies on iPod just with a few clicks! Rip and convert DVDs to iPod MPEG-4, H.264, MOV video formats to watch DVD movies on your iPod. This DVD to iPod Converter can extract audio from DVD movie to iPod music MP3, WAV, AAC and M4A. Convert DVD to iPod video files that can play on iPad, iPad 2, the new iPad, iPad 4, iPad mini, iPod classic, iPod nano, iPhone touch, iPod touch 4, iPhone 3, iPhone 4, iPhone 5, iPhone 5S/5C, iPhone 6/6 Plus, PSP, PS3 and Apple TV. User-friendly interface without any complicated settings. Rip movie DVD to iPod with just a few clicks.